This is a demo of how I paint in PhotoShop. I demonstrate preparation of scanned pencil linework and the use of color. This is a simple demo just showing my process for painting/coloring in Photoshop. There are hundreds of ways to use PhotoShop and this is just one of them. This isn’t intended to be the way of PS painting. It’s just a demo of how I choose to work. Hopefully, you will get some ideas from it and walk away with some new concepts about how to use color. I am working in a Windows XP environment with Adobe PhotoShop CS1. This isn’t intended as a beginner’s tutorial. It would be best if you already have some experience with Photoshop and are comfortable navigating your way through the program. I’ll be using a fan art I’ve done of Link from The Legend of Zelda for my examples. By the way, thanks to SaikonoYume for reminding me to post this ^.~ I wrote this tutorial a while back but because of FCK compatability issues it wasn't looking to good when I originally posted it so I deleted it right away. Yesterday (Oct 14, 2005) I finally got around to fixing those issues and can now post my tutorial. With many of my pieces, I draw them first on paper in pencil and scan them in. With this particular drawing, I chose to scan it at 500 dpi although you may want to scan at a little higher or lower resolution depending on the size of the drawing. Save the file in PSD format. Figure 1 shows the pencil drawing I’m starting with. After scanning, you’ll usually want to crop and/or rotate the picture a bit using the crop tool. The great thing about Photoshop is that you can correct mistakes easily. In the case of Link’s arm, I drew his forearm too short. Rather than erase his hand in the paper version and redraw it lower, I’ll just use Photoshop. I used the Lasso tool to select the hand and Cut and Paste it. When you do Cut and Paste in Photoshop, it will automatically create a new layer with the cut portion on it. Now I just reposition the hand where I want and merge the two layers. By moving the hand, I have created a gap in the line work so I’ll have to compensate for that. You could use the paintbrush or the pencil tool but it may be hard to create the same texture and consistency of pencil by doing that. So what I did was make use of the Clone Stamp tool. This is a tool that is used to clone a part of the drawing. All I did was clone a bit of the line and extend it a little longer to minimize the gap. Figure 2 shows the arm before and after adjustments. Often times a pencil drawing will have a lot of smudges or grain that will show up in the scan. Some scanners also tend to scan things a little too light or too dark. To fix this, go to Image > Adjustments > Brightness/Contrast… By increasing the contrast, you can get rid of some of the grain. You can also do this more precisely via Image > Adjustment > Levels. By adjusting levels you can adjust the brightness of the dark values, medium values, and light values separately. By the way, the term Value means how light or dark a color is. Next I like to go in with the paintbrush and “white out” anything that I don’t want in there. As you may have noticed in my starting image, there are a lot of other sketches in there that I don’t want showing up in my final piece so I’ll just paint them out. I’m also cleaning up the lines a bit and making them somewhat sharper. If you have an area where you erased a lot (on paper) then there might be some remnants of the graphite or impressions in the paper that showed up in the scan. Remove those as well. Sometimes after the cleaning, you may want to adjust the contrast and/or brightness one more time. I usually like to use Image > Adjustments > Color Balance on my pencil layer. For this particular painting, I plan to make the overall color green, so I’ll tinge the color of the pencil to green’s complimentary color, which is red. If you haven’t decided on your color choices for the drawing, save this step for later. Your pencil work is always going to remain on a layer of it’s own. The last thing before coloring is to prepare the layers. Name your pencil layer accordingly and set the layer mode to Multiply. See Figure 4 for how to adjust layer mode. Then create two new layers for the background and for the color of the main figure. Place these layers in the order shown in Figure 4. I’ve started off coloring by selecting the background layer and putting in a simple two color gradient of two common colors I expect to have in my background. Feel free to create a more complex gradient with several colors. Then I go in with a very large soft paintbrush with settings like an airbrush and put in some varying colors. This piece will be mostly yellow green so I’ll be using the colors surrounding yellow green on the color wheel. I almost always choose my colors either from the color picker or by using the eyedropper tool within my painting to get colors I’ve already used. I never use the swatches. I’ve put in some greens, some blue greens, yellows, yellow oranges, and I’m making sure to vary the Hue and Saturation. I’m not finishing the background at this point. I’m just putting in a little color here and there. I’ll probably go back towards the end to make changes. Figure 5 shows my piece so far. Select the maincolor layer and begin putting in your flat colors or base colors. Fill the skin areas skin color, the clothes green, or whatever. You are just putting in your base. Don’t worry about staying inside the lines because you’ll be all over the place anyway, save cleanup for later. Work quickly as this is just an under painting. On the same layer or on a new layer, begin to model it. Add your core and cast shadows. The key with my pieces has always been the color. I am being sure to vary the hue and saturation while keeping the values relatively close together. I usually use a very soft round air brush and vary the size when needed via the keyboard shortcuts [ and ]. Saturation? Hue? What does that mean? Saturation is how pure or gray a color is. High saturation is a very pure hue, where as low saturation is a muted or grayish hue. Hue is what color of the spectrum it is, as in red, yellow, blue, green, etc. See Figure 8 for a diagram of how hue, saturation, and value relate to one another within the color picker. Please note that this is when the color picker is set to its default setting H.
This step is where you’ll be spending most of your time. Don’t forget to vary your brush size. Use a smaller brush on core shadows where the form is turning quickly (a small mass) and a larger brush when the form is turning more gradually (a bigger mass). Be experimental with the color. Just because a color looks ugly in the color picker doesn’t mean it will look ugly in the painting when juxtaposed with your other paints. The opposite is also true. When you add a new color, be sure to add it in more than one place. Just because skin is peach, doesn’t mean you are limited to only putting peach colors in the skin. Take a look at some of the colors I’ve got in my piece. These colors on their own don’t look like much, but together they create a symphony of color. Don’t be afraid to use pure saturated colors as well as grays. Go all over the place. Notice how Link’s skin almost seems to have a rainbow quality. Be like Link! Be brave! Don’t be too chicken to try different colors. If you don’t like the result, you can always to Ctrl+Z (the undo shortcut) or go back via the History tab in PhotoShop. When you add a new color, try to add it in different places all over the painting. Try putting it in places you never would have thought to put it. Figure 10 is a detail shot of an original piece I did where I went REALLY crazy with the color. Look I’ve got pure saturated yellow and neon green in the skin! Notice how I use high saturation in areas where the light is hitting and low saturation in the areas of shadow. I know a lot of people who color and shade almost exclusively with Color Burn and Color Dodge in PhotoShop. They put in a base color then add shading and highlights via the Color Burn and Color Dodge tools. That’s a really quick way to do things but it doesn’t do much for the color of the piece. The skin ends up being all peach without any variation of hue and saturation in there. ALL you get is variation in value. For this type of painting, avoid using these tools for the most part. Zoom out every so often to see the piece as a whole. Don’t focus too much on the detail. Just as when you are working with traditional mediums, step back from the painting to see the overall progress. I tend to work quickly and all over the place when I do this type of painting. I don’t start with an arm and model the heck out of it and move on. (However, that is how I work when doing renderings in Acrylic) I jump around a lot and spread the color everywhere. This type of painting isn’t about detail but about color. This art is similar to Impressionism in that the focus is communication of mood through color with little focus on value and realism. Pictures done in this fashion DIE when converted to grayscale. Whereas art done with more focus on value and realism (much like Rembrandt’s work) the picture still works and holds strong. 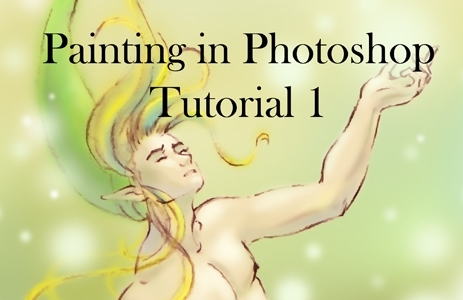 This method of painting can be really difficult to produce a hard copy of because the printer has to be really good to accurately print the hues, values, and saturations. When you are close finishing painting on the maincolor layer, return to the background layer and add some more color in there. Perhaps take some color from your main layer to add to the background. I’ve added a fourth layer above the linework layer for the bubbles of light. Try playing around with PhotoShop’s Color Balance, Hue/Saturation, and Brightness/Contrast options on your color layers. These can be found under Image > Adjustments. I’ve adjusted the background of mine to be just a touch more towards red by using Color Balance. I’ve also adjusted the size of the canvas by extending it a little more at the bottom. I felt the edge was too close to the hand so I made the canvas longer and added more paint where needed on the appropriate layers. After finishing painting I decided to crop some areas off. You may want to play around with rotation and cropping just to see if there is a better composition available to you. Be sure to create a lower resolution jpeg version of your work to email to your friends. And don’t forget to put a watermark or signature on it. There is a lot of Internet plagiarism going on these days. I almost always put my website address but if you don’t have a website, put your email on it. That way, if it happens to find it’s way on another website somewhere out in cyber space, people can still contact you about your art and find more of it. I hope this tutorial has been helpful to someone out there. Let me know what you think.